“If, among bhikṣus, bhikṣuṇīs, upāsakas, and upāsikās, there are those who uphold this dhāraṇī and recite it 800,000 times, their sins, such as the five rebellious sins accumulated over innumerable kalpas, will all be expunged. They will be reborn at places where they will meet Buddhas and Bodhisattvas. They will have all the material goods they wish. They can choose to renounce family life in successive future lives, and they will be able to observe the pure Bodhisattva precepts completely. They will be reborn either in the human world or in heaven, having ended forever the evil life-journeys. They will always be protected by gods. If there are good laymen and laywomen who keep reciting this dhāraṇī, their homes will not be ravaged by catastrophes or diseases. Their work will be smooth and harmonious, and others will believe and accept what they say. “If one has recited this dhāraṇī mantra 100,000 times, one will see in one’s dreams Buddhas, Bodhisattvas, voice-hearers, or Pratyekabuddhas, and see oneself vomit black things. For graver sins, one should recite the mantra 200,000 times. Then one will also see in one’s dreams Buddhas and Bodhisattvas as well as oneself vomit black things. If one is unable to get such good dreams because of having committed any of the five rebellious sins, one should further recite the mantra 700,000 times. Then one should have these good dreams and even see oneself vomit white things, such as creamy rice. These are signs of purification, indicating that this person’s sins have been expunged. “Next, I will now explain the procedure for using this great dhāraṇī. In front of a Buddha image or a pagoda, smear the ground of a clean area with cow dung, making a large or small square maṇḍala. According to your ability, decorate it with offerings of flowers, incense, banners, canopies, food, drink, lamps, and candles. To mark the boundary, recite the mantra to perfumed water in a vessel and sprinkle it in all four directions, also up and down. Then place a vessel of perfumed water in the center and in each of the four corners of the maṇḍala. You, the mantra reciter, staying inside the maṇḍala, should face east, kneel on your right knee, and recite the mantra 1,080 times. Afterward, the vessels of perfumed water should swivel by themselves. Next, hold a bunch of flowers in both hands, recite the mantra 1,080 times, and scatter them all on the face of a mirror. Looking straight into the mirror in front of you, recite the mantra 1,080 times. Then you should see images of Buddhas and Bodhisattvas in the mirror. Again, recite the mantra 108 times to another bunch of flowers and scatter them around as offerings to Buddhas and Bodhisattvas. Then you should receive answers to any questions you ask. “To treat illness caused by a ghost, brush the patient with kuśa grass to which you have recited the mantra. Then he should be cured. For a child possessed by a ghost, have a young maiden twist five threads of different colors into a string. Recite the mantra once each time you tie a knot in the string as you tie twenty-one knots. Tie the knotted string around the neck of the child. Recite the mantra seven times to a few mustard seeds and sprinkle them at his face. Then the condition should be removed. “Another dharma is to draw a picture of the patient on a piece of paper. Strike it in front of the patient with a willow branch to which you have recited the mantra. This should also remove the condition. “Another dharma is for a possessed patient who lives far away. Recite the mantra seven times to a willow branch. Send the willow branch to someone to strike the picture of the patient in his presence. This should also remove the condition. 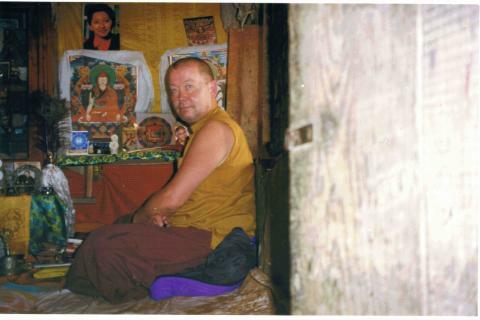 “Another dharma is to recite the mantra as you travel. Then you should be free from fear of bandits and ferocious animals. “Another dharma is to keep reciting this mantra in order that you will win any disputes or lawsuits. In crossing a river or an ocean, continuous recitation of the mantra will keep you safe from aquatic animals. “Another dharma is for a person who is in shackles or in prison. If he keeps reciting the mantra, he will be freed. “Another dharma is for a country troubled by flood, drought, or ongoing epidemics. You should mix some butter, sesame seeds, and white rice. Take a pinch of the mixture with three fingers, recite the mantra once to it, and throw it in the fire. Repeat this procedure continuously day and night in the six periods for seven days and seven nights. All catastrophes or epidemics should thus be eliminated. “Another dharma is to imprint with a stamp on riverbanks or sandy beaches the image of a pagoda. Recite the mantra 600,000 times, imprinting a pagoda each time. You will then see Avalokiteśvara Bodhisattva, Tara Bodhisattva, or Vajrapāṇi Bodhisattva. Any one of them can fulfill your wishes, give you divine medicine, or bestow upon you the prophecy of future enlightenment. “Another dharma is to circle the picture of the bodhi tree clockwise as you recite the mantra 10,000,000 times. You should then have a vision of a [holy] Bodhisattva teaching you the Dharma, and you may choose to follow him. “Another dharma is to recite the mantra as you beg for food. Then you will not be harmed or harassed by villains, vicious dogs, or the like. “Another dharma is to recite the mantra 300,000 times in front of a pagoda, a Buddha image, or a pagoda containing holy relics. Furthermore, on the fifteenth day of a waxing moon, make a large offering and recite the mantra mindfully without eating food for one day and one night. You will even be able to see Vajrapāṇi Bodhisattva, and he can take you to his palace. “Another dharma is to go to the pagoda where the Buddha first turned the Dharma wheel, the pagoda at the Buddha’s birthplace, or the pagoda where the Buddha descended the jeweled steps from Trayastriṁśa Heaven, or a pagoda containing holy relics. If you recite the mantra as you circle the pagoda clockwise, then you should see Aparājitā Bodhisattva and Hāritī Bodhisattva. They can grant your wishes, give you divine medicine if you need it, and show you the Bodhisattva Way by teaching you the Dharma. Whoever recites this dhāraṇī, though he is not yet in a bodhimaṇḍa, will have all Bodhisattvas as his beneficent friends. As the Buddha was expounding this Dharma of the Great Cundī Dhāraṇī, innumerable sentient beings shunned dust and filth [their afflictions], and gained the virtue of the Great Cundī Dhāraṇī, the great illumination mantra. They were able to see Buddhas, Bodhisattvas, and other holy beings [in worlds] in the ten directions. 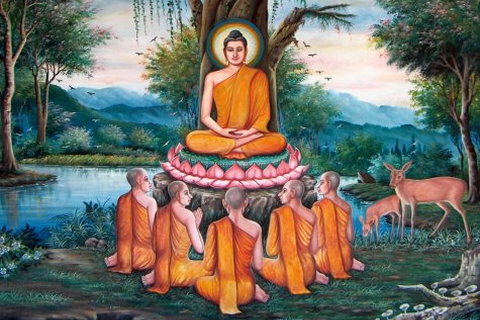 [The listeners] made obeisance to the Buddha and departed.